[mrgreen] Many people who frequent casinos have probably noticed the Quick Hits machines. They are always busy with action and are in nearly every casino. The creator of this game is Bally a well know name in the gambling industry. There are many variations of the Quick Hits machines including Quick Hits, Quick Hits Platinum, Quick Hits Stars and Bars and more. These games are now available online as well. The overview is the same for the game itself whether played in the comfort of your own home or in the fun atmosphere of the casino. These machines are very popular within the gambling community because they come with a different type of excitement. There are a few ways a player can win cash or credits. There’s the common way to win, which is to get three like symbols in a row on a payline. If you get more than three then the payout is increased. Ways to win larger amounts is to get five jackpot symbols which in turn pays the player the jackpot amount. This amount is dependent on each individual machine. One can also get the free game symbols and these will initiate the bonus round, which is equally as exciting. And the final way is to get five or more Quick Hits symbols on the screen in one spin. 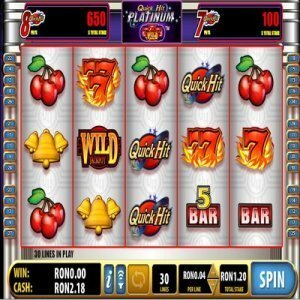 Quick Hits Platinum is a progressive game, which means the machines jackpots are linked together. These progressive jackpots are usually no less than $15000. Once someone hits the jackpot, all of the machines are then reset to the default amount. In order to win the large amounts, one must bet max credits. These machines can range from a minimum bet of $.30 to a maximum of $3.00. Always remember, the less you bet the more you lose when you win. You can win just by getting anywhere from three to nine Quick Hits symbols anywhere on the screen. Three will get you your initial bet back and nine will payout 2000 times your bet. This is why when playing Quick Hits Platinum, you want to bet max whenever possible. The bonus round is exciting because it begins as an interactive game. You start by choosing tiles from a board. These tiles include free spins, multipliers and a wild card. Once you match three like free spin tiles or two free spins and a wild tile, the bonus round will begin. The bonus can be re-triggered during the free spins giving you even more opportunity to win. The Quick Hits Platinum machines also feature platinum symbols. If you receive five of these within one spin, you will be awarded the jackpot. Like mentioned previously, this is no less than $15000. You will only receive the jackpot amount if you are betting the maximum amount allowed on that particular machine. Otherwise these five platinum symbols will pay 5000 times your bet. This still results in a nice amount of money. Overall, this is a very fun and exciting slot machine. Many people agree and it seems to have a large following at land based casinos. Quick Hits Platinum tends to pay out well and usually you will see people patiently waiting to try their luck.